A team of experts from the Department of Neurobiology and Behaviour at Cornell University, led by Michael Smith, studied what starts the reproductive cycle of honeybee colonies. The results are published in Springer's journal Naturwissenschaften - The Science of Nature. 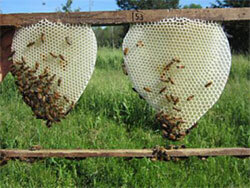 Reproduction isn't always a honeybee colony's top priority. Early in a colony's development, its primary focus is on survival and growth. When the colony reaches a certain stage, its workers start investing in reproduction. The first step in this whole reproductive process is building cells of drone comb, the special comb made of large cells in which drones are reared. Dr Smith and his team were puzzled about precisely which colony features kick-start this key process of building drone comb. Is it the number of workers in the colony? Is it the total area of worker comb in the colony? Is it the amount of brood in the colony? Or perhaps it's the size of the colony's honey stores? The Cornell University researchers therefore set out to carefully manipulate each of these features in different groups of colonies, while keeping the other colony features identical. The researchers were still left wondering about precisely how an individual worker bee 'knows' how many other workers there are in its colony. Dr Smith and his team speculate that this might have to do with how crowded individuals feel while working side-by-side in the hive. They are currently engaged in further research to shed more light on this mystery. "Colonies with more workers built a greater proportion of drone comb, but colonies with more comb, more brood, or more honey stores, did not do so," Dr Smith summarizes. "We estimate that a colony needs approximately 4,000 workers to invest in building drone comb." The researchers believe that their findings are also relevant to other social systems in which a group's members must adjust their behaviour in relationship to the group's size.